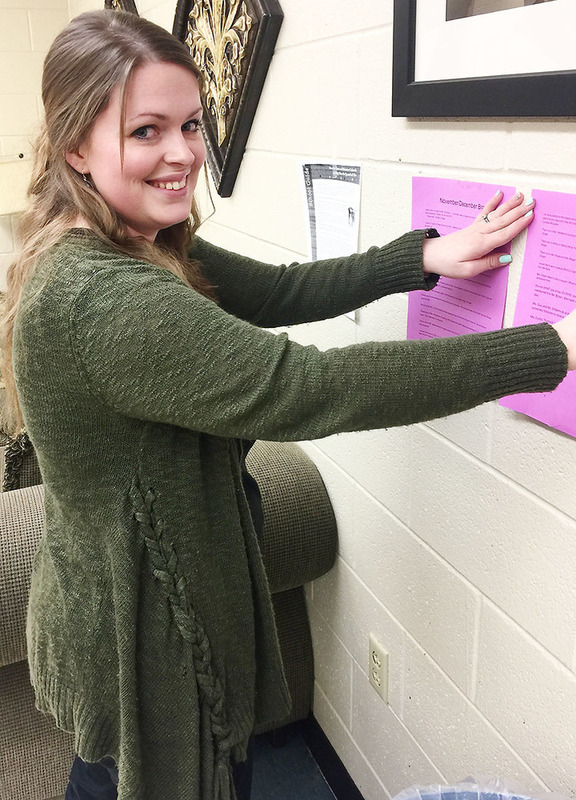 Megan Trucks, third-year third grade instructor at Blytheville Elementary School, posts e-mails from November in the teachers’ lounge regarding “Brag on Your Buddy” for the rest of the employees to read. One of Blytheville Elementary School’s teachers has come up with a program that is designed to help fellow employees who do their best at their jobs to know that someone appreciates their efforts, and to offer some encouragement to others who may be having a rough day. The program is the brainchild of Megan Trucks, in her third year as a third grade teacher. According to Trucks, who participated in the Leadership Institute last summer for BES at the Arkansas Leadership Academy, “Brag on Your Buddy” is really very simple: Any employee who sees a fellow employee doing something positively for either a student or another person is encouraged to “give a shoutout” about that person’s efforts in an e-mail to Trucks. Trucks makes a list every month of all the e-mails received, and then posts paper copies of those e-mails inside the teachers’ lounge and curriculum center. The project is for teachers and staff only, although Trucks said she can see how it could apply to students too. For example, Trucks said that she has received positive comments from others about the good relationship another person may be having with his or her students regarding a certain subject, a “thank-you” to a person for just bringing her a cup of coffee and a “shoutout” provided by another teacher for providing lesson plans to students while she was sick. “Regardless of how dedicated a person is to his or her job, everyone likes to be recognized for their positive contributions,” Trucks added. “‘Brag on Your Buddy’ is making employees feel good, and as a result the teachers end up helping other teachers.” She also said that overall employee morale has definitely improved. Trucks stated that maintaining the BOYB e-mails do not impose on her time as a BES teacher. “At the end of every month I simply make a list of the e-mails and then distribute them,” she said.